Read Our Current My Side of the Fence here. “Ok, so they aren’t ridable anymore.” It never ceases to amaze me how many people get rid of a horse that has been good to them for many years because they can’t ride them. It just astounds me that people who have had the same horse for a long time, 10-20 years, just get rid of them like they were never a part of the family. 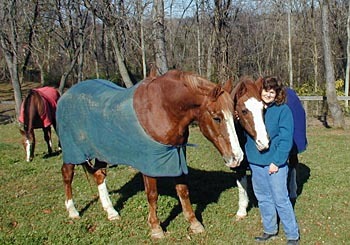 Horses can live a long time and that is something you must be prepared for when buying a horse ... the long haul. The reality is they are a lot more fragile than people realize and buying a horse at 5 years old doesn’t guarantee that in another 5 years the horse will still be sound and ridable. They should be, but things can happen, especially if they are overworked. We have been getting so many calls on older horses that people don’t want. These are horses that have worked hard, been shown, done lessons for many years, and packed people around for a good part of their life. What they deserve is a decent end. They deserve love and attention for their efforts. Sadly, many don’t get that. It dawned on me the other day while trying to save an older horse from being sent to the auction where his fate no doubt will be a trip to the slaughterhouse. I know there is a huge overpopulation of dogs and cats and the horse problem can’t compare, but the big difference is these animals are being humanely put to sleep. The horses are not -- their ends are terrifying. They deserve better than their owners making a few bucks off of their bodies. Horses sent for slaughter die a horrible death, and being creatures of flight with their keen senses they are fully aware of their fate at the slaughterhouses. We need to do better as horse owners for them. They deserve better. 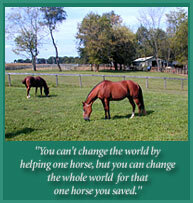 Almost all the horses here on the farm would have ended up with the same fate if we hadn’t worked together to save them. Ok, so they can’t be ridden, now what? I have little time to ride and quite honestly, riding was fun but I love being with the horses. I spent hours as a young girl sitting in my favorite lesson horse's stall. I made friends with all the sale horses that came in ... showing them a little kindness, as their futures were so unsure. It broke my heart when I learned that some of the lesson horses I loved went away when they became unridable and later found out they went to auctions. Horses are so much more than what they can do when you are on their back. The bond you can develop with them is so precious. They are forgiving and they love you unconditionally. What a gift. I see this gift when the kids from a local special school come and brush some of the horses. These kids blossom! The kids keep coming back and they don’t ride. But these older lame horses reach deep and touch them; they break through the garbage that haunts them and love them. Just because your horse isn’t ridable doesn’t mean anything other than you can’t ride, and they still have so much to offer. People that came to Mylestone’s Open House are so touched by the horses. Despite some horrible abuse they have suffered, almost all of them still reach out offering love. Please remember the unwanted horses here at Mylestone who have given their all, and now thanks to your generosity will have peace, love and a place to call home.